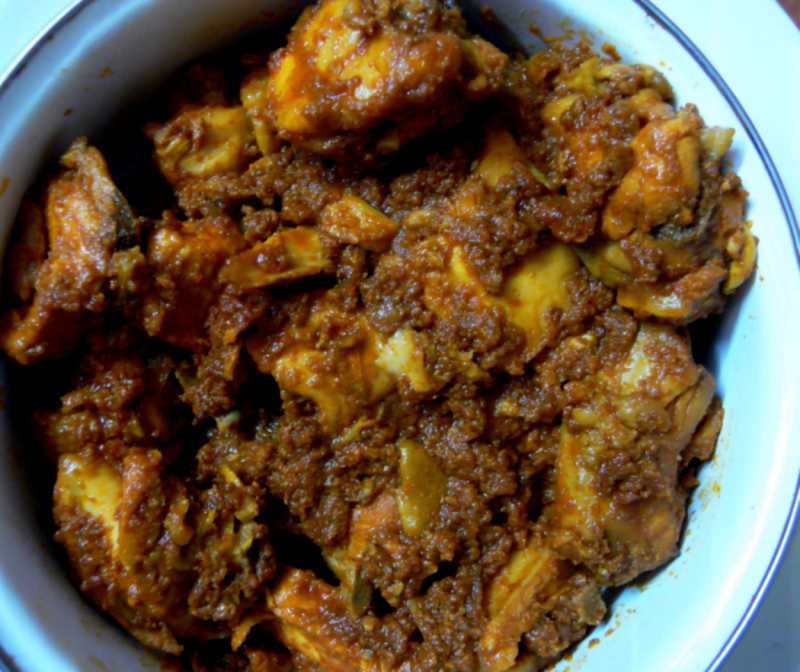 This recipe is from my husband.I tasted this chicken preparation(by my hubby) for the first time when he came to see me with this and Mutton Biryani (prepared by my M-I-L) after I got engaged to him. So tasty is the dish that I thought to share it with u. Clean the chicken pieces and marinate this with 1 tsp ginger-garlic paste,turmeric powder,soy sauce and 1/2 tsp salt.Mix this well and leave it for 30 mins atleast. Cut the onions and chop the tomatoes. Heat 1 tbsp oil in a pressure pan and add the cardamom,cloves and cinnamon stick.Add the sliced onions,curry leaves and cumin seeds and saute this for 5 mins or till done golden brown. Add the remaining ginger-garlic paste,tomato pieces and 1 tsp salt and saute this well for another 5 mins or till tomato begins to melt. Add the chilli powder,green chillies,sugar and mix this well. Add the marinated chicken pieces along with the marinade,coriander leaves and ajinomotto and mix well. Add 1 cup water and allow this to boil and close this with lid and pressure cook upto 4 whistles.Turn off the flame and Leave this for few mins.Open the pressure pan lid after 15 mins. Garnish with few coriander leaves.Serve this hot with rice or Indian bread of ur choice. Hi ! Christy , Tried out your recipe . It was Awesome . The combo Veg Fried Rice nd Ur chicken medley was too good . Thank U so much . Hi ! Great recipe . Awesome pic . Irresistible Chicken . Will try out dis weekend nd let U know . Thank U . Thanks Christy, you are indeed lucky to have such a great husband who can cook. Mine does too, but he dirties a lot of dishes and the kitchen as well and I have to clean up! The chicken came out well, I would rate it as 5*, the only thing is I avoid aji-no-moto as it brings on a migraine headache. I TRIED THIS RECIPE. CAME OUT SO GOOD. YOU ARE DEFINITELY VERY LUCKY. YOUR HUSBAND IS A GOOD COOK. Hi Sarah!.Thank u so much. sounds too tempting.. will surely try tomorow afternoon :) thanx ! Coolcook!.Mu husband is a distant-relative of mine and he was allowed to meet me after I got engaged to him only.He's an expert cook and prefers food-if done by me or by my M-I-L (mostly I used to cook even when I had a servant). Hello Chris, Your chicken looks quite tempting, so you accepted his proposal after you had this??????? Yes Rabz,I must admit that his cooking as always better than mine.But he enters the kitchen only if I fall sick now(busy at work).I miss his wonderful recipes often. Lolz Christy, this must be a memorable/romantic recipe for you.So both you & ur hubby must be cook cooks?? Thanks for sharing. Cheers.